Mankind reached for the stars, and civilization crumbled. The Red Planet was Mankind’s first home after Earth. But when silence fell across the solar system, humanity found themselves in a new dark ages. Alastair is a serf, toiling in the lands of his lord. Each day the blue orb of Earth rises on the horizon, whispering of the ancient time of magic, when mankind travelled the night sky, but that time is long past and he is content with his lot. Until his beloved Lynessa is struck with the dreaded curse – a mark on the skin that brings certain death. When Alastair hears the legend of an artefact from the time of magic that can lift the curse, he leaves his lord’s lands and journeys to the Argyre Planitia in search of a fabled cure. But the dense jungles there contain unthinkable creatures, remnants engineered from a time long ago, and a tribe of warriors who will stop at nothing to protect the artefact. 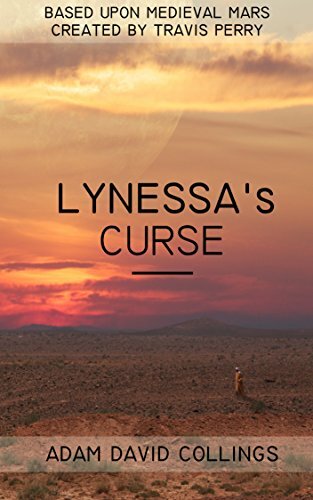 Lynessa’s Curse is a novella originally published in Medieval Mars: The Anthology created by Travis Perry. Begin your epic journey on the Red Planet today!